SKU: SKCSBG1. Category: Boxing Gloves. Tags: Bag gloves, Boxing Gloves, Kickboxing Gloves, Muay Thai Gloves, Sparring Gloves. Want to add an extra edge at training? Want to look stylish and intimidating as you perfect your technique? 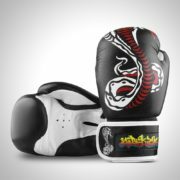 Well as always we have all of your needs covered at Sidekick HQ as we unleash the new Cobra series of Muay Thai style boxing gloves. These superior boxing gloves are velcro fastening and made from the highest grade of genuine leather. Available in black, white, blue, red and pink. Boxing gloves come in the sizes 10oz, 12oz, 14oz and 16oz. Strike safely, strike like a Cobra, we are always in your corner.